Each week, The Rebel Walk’s Jeff Tetrick takes a look at the Ole Miss Postgame Points, examining five takeaways from the Rebels’ most recent football game. Here are his Postgame Points from the game against LSU. 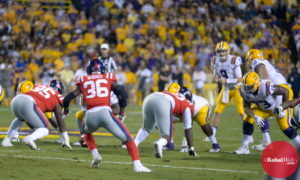 Ole Miss was defeated by fifth-ranked LSU 45-16 on Saturday night at Tiger Stadium in Baton Rouge. The Rebels are 3-2 heading into the final non-conference game of the year against Louisiana-Monroe at Vaught-Hemingway Stadium on Saturday. One bright spot on a tough night in Baton Rouge was that the defense created two takeaways against the Tigers. It marks the fourth consecutive game in which the Rebels have forced two or more turnovers, the best streak since a six-game stretch in September and October of the 2014 season. Qaadir Sheppard and Mohamed Sanogo forced a pair of fumbles that were recovered by C. J. Miller and Zedrick Woods. Junior Scottie Phillips continues to display consistency for Ole Miss in the run game each week. Against LSU, Phillips toted the rock 16 times for 96 yards and the Rebels’ lone touchdown. With the exception of the Alabama game, Phillips has rushed for at least 96 yards and 1 touchdown in each game this season. Through five games, Phillips has run for 563 yards and 6 touchdowns. Phillips has contributed as a receiver out of the backfield by grabbing 4 receptions for 48 yards and 1 touchdown, as well. Sophomore punter Mac Brown was busy against LSU, punting the ball six times on the night. Brown averaged 47.8 yards per punt, which included a career-best 63-yard punt. While Ole Miss fans prefer not to see the punter in the game, it is encouraging to see Brown’s effort against the Tigers. With six SEC contests remaining on the schedule, having a punter who can boot the ball well can help change field position in tight games. Sophomore kicker Luke Logan had a great performance against LSU. Logan connected on all three of his field goal attempts on the night, and he drilled a career-best 40-yard field goal in the final quarter. Logan has made 8 of 9 field goal attempts on the season. He has made 20 of 21 PATs and has scored 44 points for Ole Miss this year. Having a placekicker who can put the ball between the uprights can be valuable in close games. While Ole Miss only reached the red zone on three occasions against fifth-ranked LSU, the Rebels came away with points on all three of those possessions. The Rebels tallied a touchdown and two field goals in the red zone, for a total of 13 points. While finishing drives with touchdowns is the ultimate goal in the red zone, it is just as important to come away with points on any red zone opportunity. Ole Miss needs to reach the red zone more than three times per game in SEC action, but the bottom line is that the Rebels must put points on the scoreboard every chance they get in the red zone.